For $585 million, the Pentagon will try to build a ballistic missile defense system for the state lying closest to North Korea. It's been nearly 12 months since the great "Hawaii false missile alert" happened. On Jan. 13, at 8:07 a.m. local time, Hawaii's Emergency Management Agency mistakenly broadcast a warning about an incoming ballistic missile threat. Recipients might have been inclined to disregard the warning as a mere drill -- but for the fact that the alert specifically urged them to understand that "this is not a drill." Panic erupted across the islands, alongside calls for beefed-up missile defense in the U.S. Senate. Twelve months later, that's starting to happen. How much is too much to protect America from this? Image source: Getty Images. Earlier this month, in a publicly disclosed contracts update, the Pentagon announced that it has awarded Lockheed Martin (NYSE:LMT) $585.2 million to "design, develop, and deliver" a "Homeland Defense Radar-Hawaii (HDR-H)" system to ensure "autonomous acquisition and persistent precision tracking and discrimination to optimize the defensive capability of the Ballistic Missile Defense System (BMDS) and counter evolving threats." In a press release responding to the award, Lockheed Martin clarified that it will utilize its Long Range Discrimination Radar (LRDR), currently under construction in Clear, Alaska, and expected to go online in 2020, "to provide the lowest risk and best value HDR-H solution to [the U.S. Missile Defense Agency]" in Hawaii as well. HDR-H is to be built on the island of Oahu by the end of 2023. Once both are ready, LRDR and HDR-H will be incorporated into Lockheed's Ballistic Missile Defense System (BMDS), incorporating both shipborne and "Aegis Ashore" elements. In this way, Lockheed and the Pentagon will respond to Hawaii Congresswoman Tulsi Gabbard's demand that the military put "a missile defense system in place in Hawaii to defend Hawaii." Hawaiians should be happy to hear that. Lockheed Martin investors should be pretty pleased, too. Thanks to Hawaii's Emergency Management Agency snafu, their company is about to be gifted $585 million in extra revenue that might otherwise never have been awarded. Granted, for a business as big as Lockheed Martin, with $51 billion in annual revenue, even a half-billion dollars won't really move the needle very much. This entire contract, spread over five years of performance, will amount to barely 0.2% of the company's annual business. Still, there are at least a couple reasons investors might want to pay attention to it. The first reason has to do with where Lockheed will be routing its ballistic missile defense revenues through. Although a system for tracking and shooting down missiles with other missiles, Lockheed is not recording HDR-H revenues as part of its Missiles and Fire Control (MFC) business, as you might expect -- but rather as part of its Rotary and Mission Systems (RMS) division. RMS is the division that had its profit margin artificially depressed two years ago, when it absorbed the low-margin Sikorsky helicopters business from United Technologies, dropping its operating profit margin almost instantly from 7.9% (in 2015) to just 5.9% (in 2016), with a further fall to 5.6% over the last 12 months. (For context, that's less than half Lockheed Martin's overall profit margin of 11.6%). 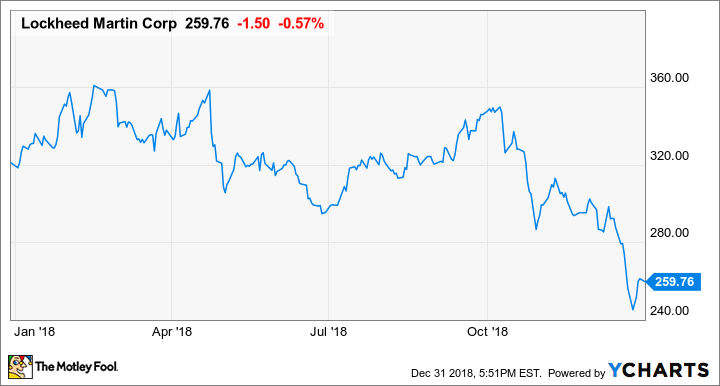 Lockheed's winning the HDR-H contract, which one presumes will be more profitable than the revenue the company has been getting out of Sikorsky, promises to help reverse this slide in profit margins in Lockheed's second largest division by revenue. The picture could improve even more if the Pentagon decides to expand its investments in missile defense in the future. Lockheed notes that it is designing LRDR and HDR-H with an "open, scalable architecture for future growth." That suggests the company has hopes of winning additional, higher-margin missile defense awards of a type similar to HDR-H. With Lockheed Martin stock currently trading for a rich 24 times earnings -- earnings that, according to data from S&P Global Market Intelligence , are little better than what the company was earning five years ago -- every little bit of extra revenue helps. And the bigger the profit margins on those revenues, the better. Editor's note: A previous version of this article attributed Lockheed Martin's HDR-H contract to the company's Missiles and Fire Control business, rather than to Rotary and Mission Systems. The Fool regrets the error.